What? 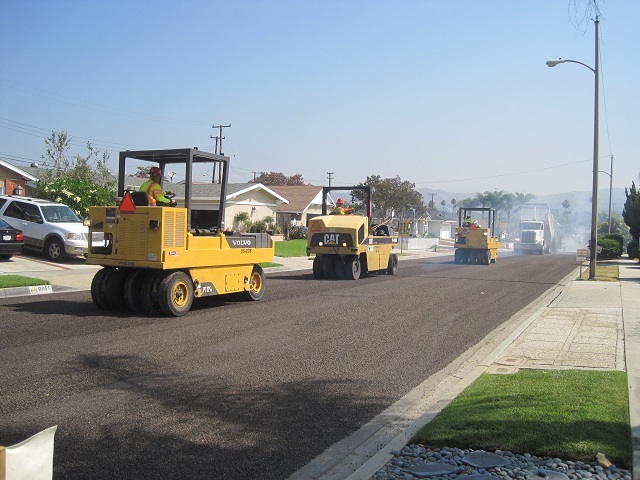 A chip seal is a two-step process which includes first an application of asphalt emulsion and then a layer of crushed rock to an existing asphalt pavement surface. A chip seal gets its name from the “chips” or small crushed rock placed on the surface. Asphalt emulsions used in chip seal applications contain globules of paving asphalt, water, an “emulsifying agent” or surfactant, polymer, and sometimes a “rejuvenator.” Soap is a common form of a surfactant. In washing clothes or dishes, the surfactant helps remove the dirt and suspend the dirt particles in the wash water. Similarly, in asphalt emulsions, the surfactant keeps the paving asphalt globules in suspension until it is applied to the pavement surface when the water in the asphalt emulsion starts to evaporate. 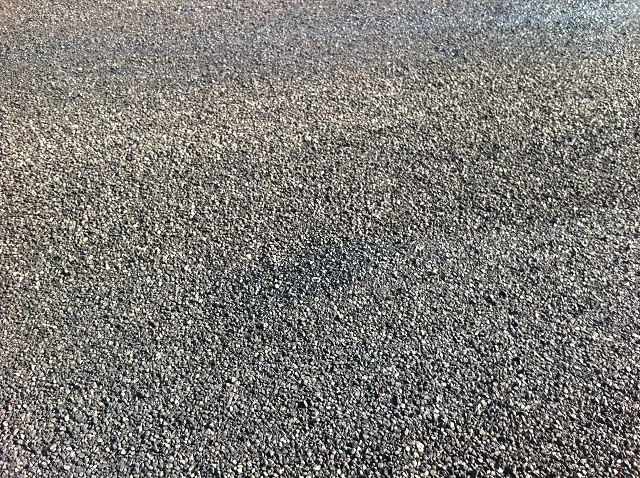 The chips (small crushed rocks) are immediately applied after the asphalt emulsion is applied to the pavement surface. The polymer in the asphalt emulsion is a “hardener” which serves to improve the adhesion to the crushed rock and to the pavement surface. A “rejuvenator” is an asphalt or additive which when applied to the existing pavement will slightly soften the pavement it is applied to creating a better bond. Why? Chip seals are placed under one of three scenarios, as a “wearing course” meaning vehicles drive directly upon it; as part of a “cape seal” meaning a chip seal is first placed, then covered by slurry seal or microsurfacing; or as an “interlayer” meaning a layer between underlying asphalt pavement and a new asphalt or rubberized asphalt surface. As asphalt pavement is subjected to traffic loads and as it ages, it oxidizes, becomes more brittle and cracking develops in the pavement structure. A chip seal serves to seal the narrow cracks, help bind together cracked pavement, provide a wearing (driving) surface, and protect the underlying pavement structure. Chip seals used as interlayers serve to retard reflective cracking which develops from the bottom of the pavement structure towards the top. When? Chip seals are typically applied on an intermittent or one-time basis. Location, weather, traffic loading, and pavement conditions are factors used to determine if a chip seal application is appropriate. Roadways selected for chip seal treatments are commonly those which have moderate block (or “alligator”) cracking which is not spalling (or “popping out”), no rutting, an acceptable ride quality, and in which a chip seal would help extend the pavement life until resurfacing or rehabilitation can be performed. Roadways chosen for cyclical chip seal applications would typically be treated every seven to ten years. How? 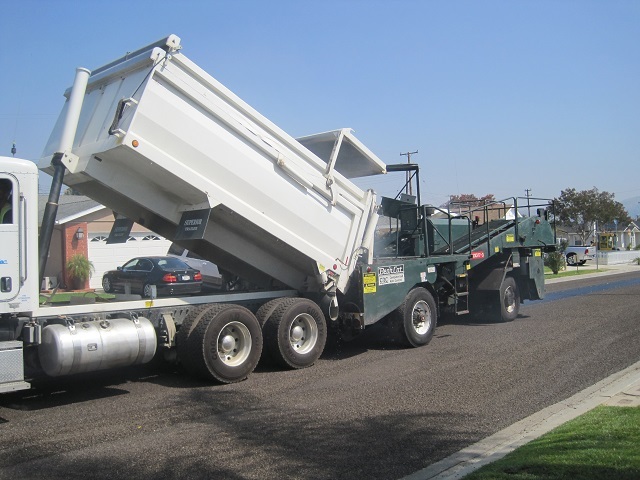 A distributor truck first applies the asphalt emulsion to help seal the pavement surface. Using an asphalt emulsion is considered a “cold applied” chip seal even though the liquid temperature is typically between 110 and 150 degrees Fahrenheit. 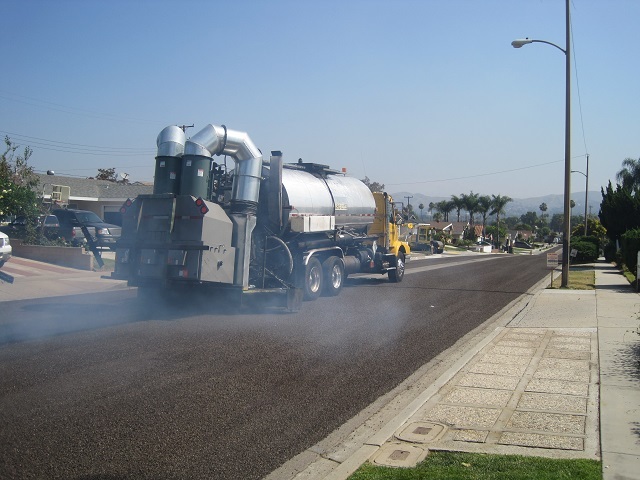 No smoke results from the application of emulsified asphalt. If modified paving asphalt is applied, it is considered a “hot applied” chip seal as the liquid application temperature is typically between 325 and 375 degrees Fahrenheit. Smoke will result from the application of modified paving asphalt but should not be of concern. Depending upon formulation, the distributor truck may be equipped with a smoke reduction device which reduces the level of blue smoke emitted. This is normal. These devices are subject to permitting and oversight by the jurisdictional air quality management district. 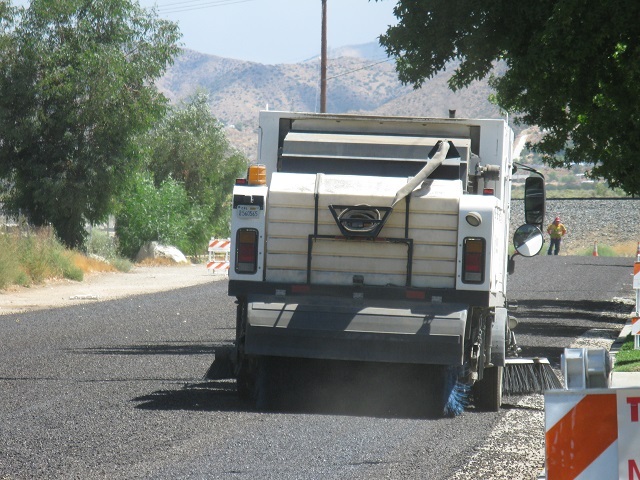 Immediately following application of the asphalt emulsion, a “chip spreader” follows and applies crushed rock to the top of the asphalt emulsion. A dump truck dumps crushed rock into the chip spreader as it travels. The dump truck appears to be going in reverse but it actually is being towed backward by the chip spreader. Following chip application, rubber tired rollers follow closely behind. The purpose of the rollers is to push the chips down into the binder and enhance the bond between them. A steel drum roller commonly follows the rubber tired rollers on “hot applied” chip seals. The final operation is placement of a “flush coat.” The flush coat consists of the application of a fog seal (see fog seal) followed by the application of very clean sand. The purpose of the flush coat is to help “lock down” the chips and absorb any excess asphalt emulsion. The result is a pavement surface that has a rough texture and a very deep, rich black in color.